« Are you ready for Christmas 2011? See Results update at the end of this post. Reader’s Digest are running a 100 word story competition. Stories should be original, unpublished and exactly 100 words long (99-worders will be disqualified). The title will not be included in the 100 words. Email your stories to theeditor@readersdigest.co.uk by January 31. The winner will receive £5,000 and the two runners-up a £100 book token each. All 3 stories will be published in Reader’s Digest. There is also a schools’ section to the competition with the winner in each of the 2 age groups getting £1000 in high street vouchers plus £1000 for the winners’ schools. However; there has been some controversy in writing circles about the terms and conditions of this competition. These state that ‘contributions become world copyright of Vivat Direct Ltd (t/a Reader’s Digest)’. This means that Reader’s Digest take the copyright of all stories entered, not just the winning stories that are published in the magazine – therefore you couldn’t then publish or enter your (winning or losing) story in a similar competition elsewhere. There has been discussion about this on the Writers’ News Talkback Forum, with the participants split between those willing to give up copyright on their story for the chance to win £5,000 and those who thought that writers should never give up copyright on anything without some form of payment or acknowledgement. 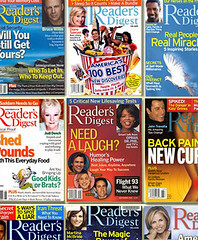 Gill Hudson, editor-in-chief of Reader’s Digest, explained the policy to Alex Gazzola in the January issue of Writers’ News. You will have your own opinion about whether you want to give away your carefully crafted 100-word story in exchange for a chance at a £5000 jackpot. Personally, I think it’s worth the gamble. I do recycle work that is rejected by its original target market or fails to make the grade in a competition. However, I usually find that the work has to be tweaked in some way before it can be resubmitted, this may mean lengthening or shortening it or changing the tone slightly to fit the new market. I expect this would be the case if I wanted to recycle my 100 word story for another micro fiction market – it may have to be moulded to fit a set theme or again, made longer or shorter to suit the new requirements. So, I will make a note on the filed copy of my entry, to remind myself to wait until the results of the Reader’s Digest competition have been announced and then (if I lose) to change the story substantially before resubmission. The winner is announced here. The standard of writing was so high that Reader’s Digest have decided to feature one story a day on their website – please leave a comment if yours is featured so that we can all admire it! This entry was posted on December 19, 2010, 12:00 pm and is filed under Competitions, Writing. You can follow any responses to this entry through RSS 2.0. You can leave a response, or trackback from your own site. I submitted my story several months ago using an e-mail on my old laptop. In case my story has gained a place in the competition, and you need to contact me,please use my NEW e-mail address. Evan – I am not involved with Readers’ Digest or the organisation of the competition. I was merely bringing in it to people’s attention on this blog. Please contact Readers Digest directly to change your email address. I hope you do well in the competition! Anne – I don’t have any connection with the organisers of the Readers Digest Competition (or any other competitions mentioned on my blog). I am just bringing the competition to the attention of other writers who may wish to enter. I’m very sorry but I don’t know when the results of this competition will be available. But best of luck to your pupils! I received an email saying they were going to use my story on their website but no mention of a placing in the competition etc, so presume they have made their mind about the results and are in the process of putting together the winners and some of the losers for the site. Kev – thanks very much for this comment. I know a lot of people have been trying to find out the results of this competition. And well done! Your story must have been good to make it on to the website because I bet they had a LOT of entries. Please post a link up here when you have one – so that we can all read your story! Thanks for the update, Rachel and well done Kevin!